An early explorer of Narragansett Bay, Giovanni da Verrazzano, saw the islands covered with Rhododendrons and was reminded of the Mediterranean Isle of Rhodes… or so goes one of our beloved mythologies of how our little state came to be named Rhode Island. Another story says that Adrian Block, a Dutch explorer for whom Block Island is named, referred to a “red island” in Narragansett Bay, Roodt Eylant in Dutch. 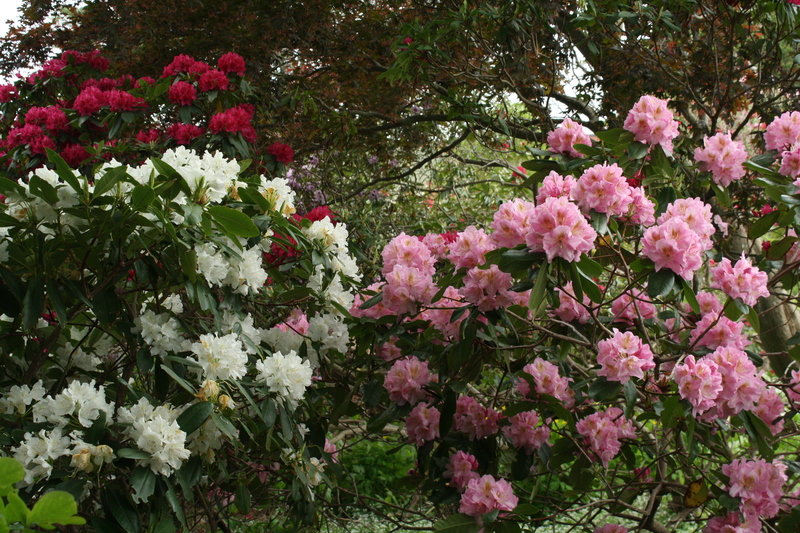 Either way, we love Rhododendrons. 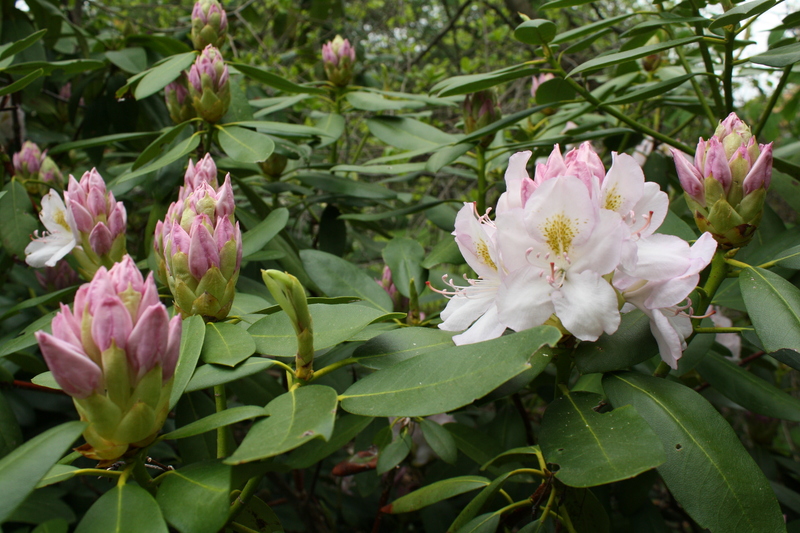 There are native Rhododendrons, R. maximum, in the understory of wooded areas all over the state. Tales are told that these groves of Rhododendrons were so big in colonial times that a person could become lost in them! The Ell and Long Pond area in Hopkinton has huge Rhodies which give a hint of this possibility. 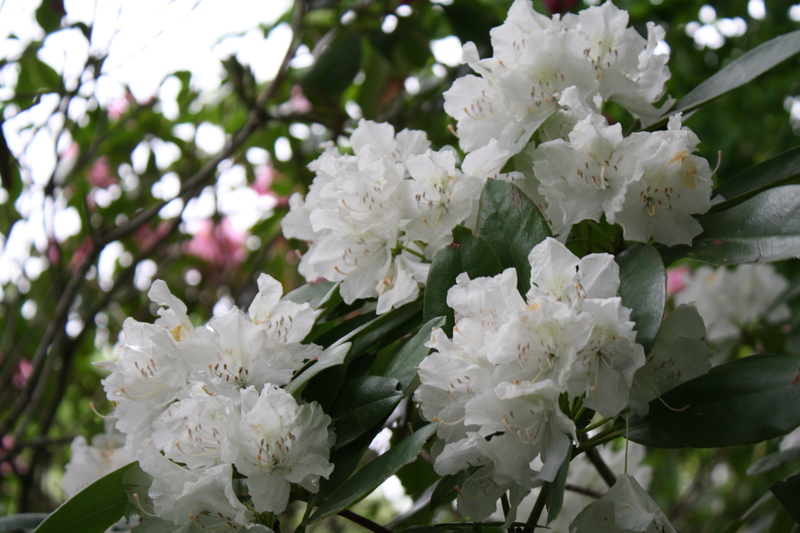 The cultivated Rhododendrons are also very much at home in our maritime climate. They thrive here, for the most part, and are widely planted as ornamentals. Their incredible tropical flowers are a big part of the late spring/early summer landscape, and I love seeing them as we approach the longest days of the year. 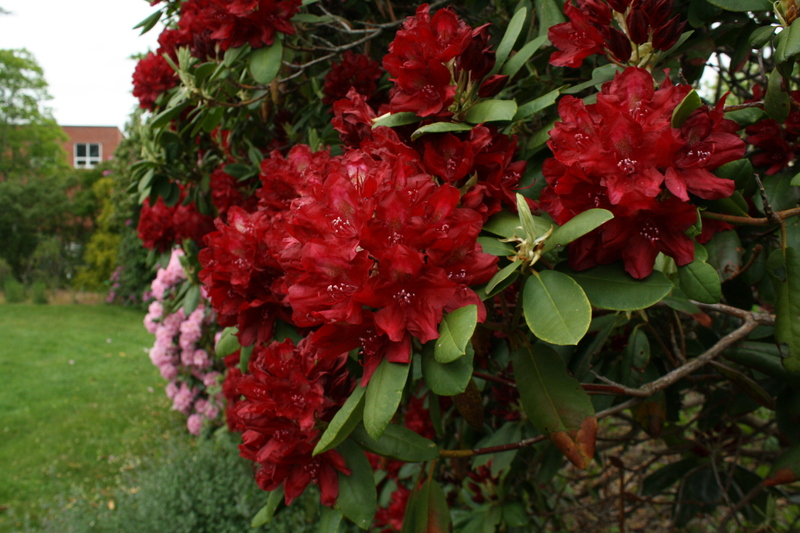 Rhodies come in a wide spectrum of colors. There are probably thousands of different pinks, along with whites of every variety, and purples from light to dark and approaching blue. There are some warm tones, like the deep red ‘Francesca’, and even orange and yellow, which are not often seen around here. 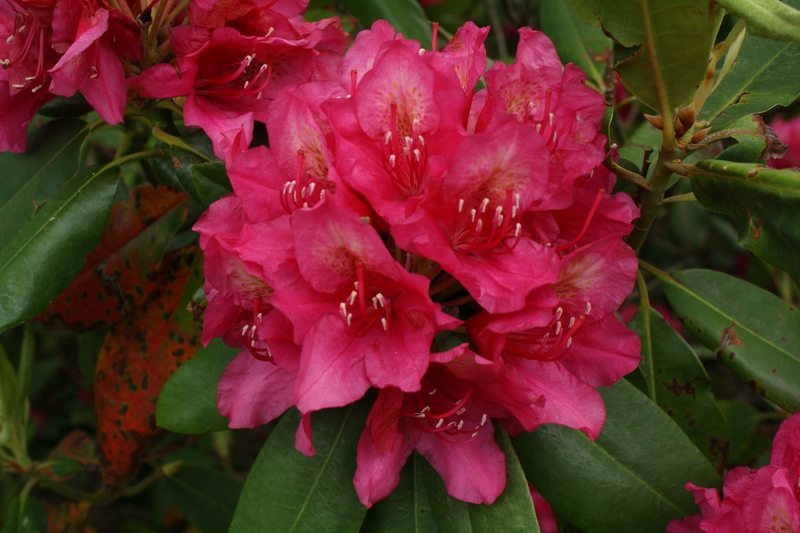 Sometimes Rhododendron flower buds are a different color than the open flower. All have a splotch or eye which is sometimes highly contrasting with the flower color and sometimes barely visible. 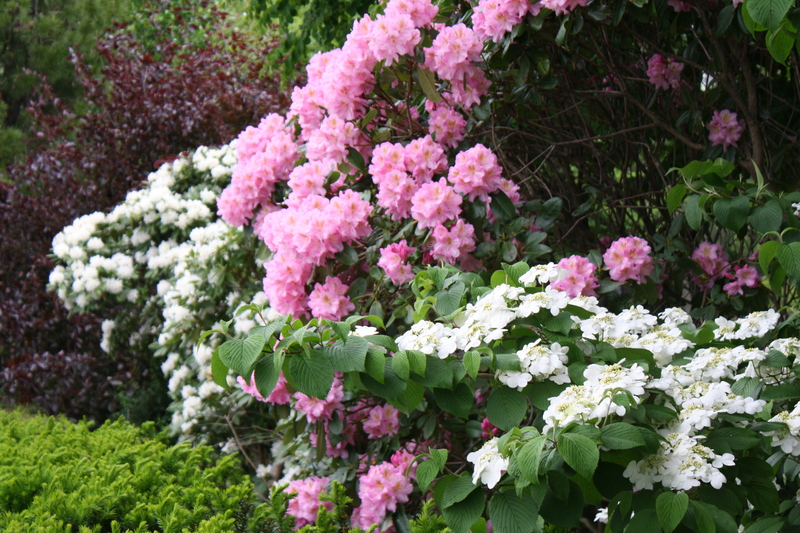 Shallow-rooted, Rhodies like moist soil but not “wet feet”. They like a little bit of shade, being an understory plant. They will grow in full shade but flower more with some sun. They prefer acid soil, with good organic matter, and don’t like to dry out. They are mostly evergreen, with leathery long deep green leaves (although this varies from one species to another). Like other evergreens, they are susceptible to “winter kill” leaf damage when the ground is frozen. Planting in an area protected from strong winter winds helps prevent this. Being well adapted to our climate (zone 6-6A), many Rhodies grow fast. And what many home gardeners don’t realize is that they can be cut back hard. How hard? Down to little stumps! I love to tell bore students with the story of how my first job at East Farm was to cut down the Rhododendrons along the fence leading to the gate. I was horrified but they came back better than ever. So if they are covering the first floor windows of your house, don’t be afraid to cut back, AFTER they flower. 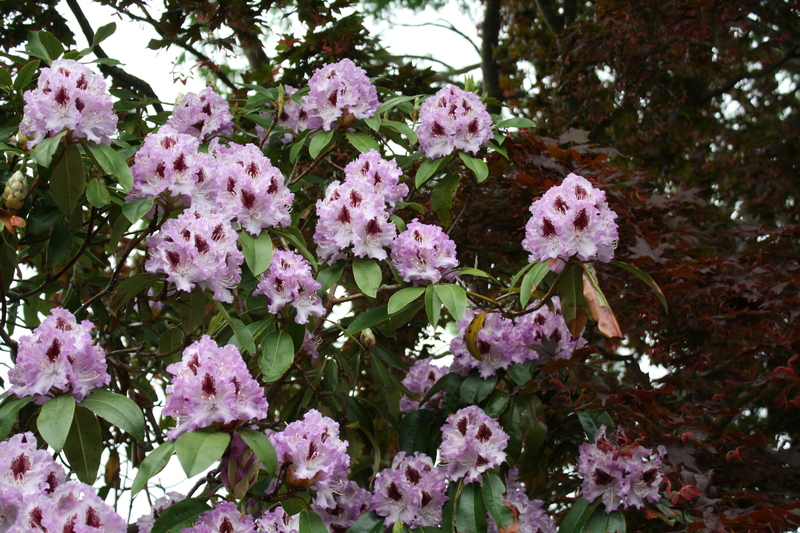 There are thousands of Rhododendron species around the world, native to environments from the tropics to the Himalayas. 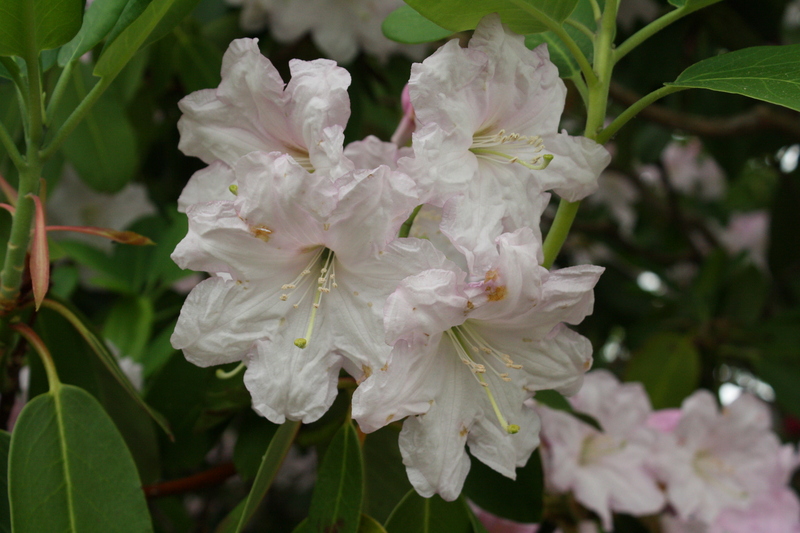 There are a multitude of hybrids and cultivars, especially if you count Azaleas, which are Rhododendrons (that’s another post). Most likely there is one you can grow at your house! 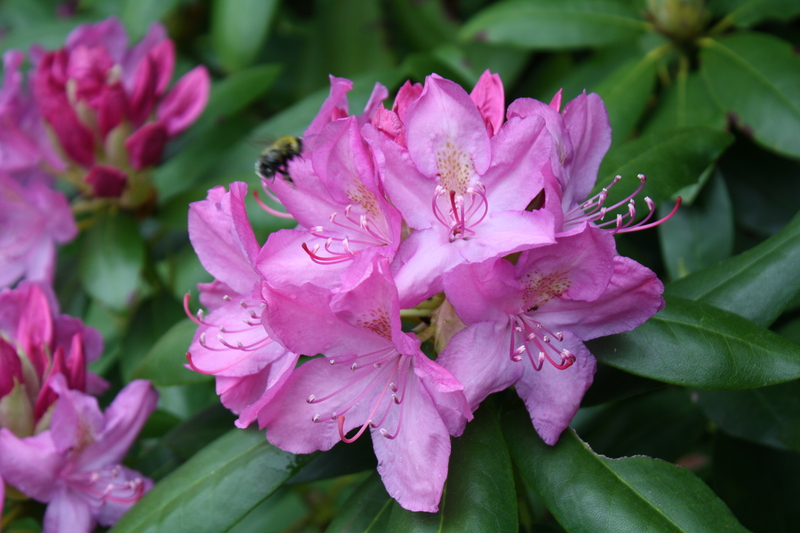 The best way to find the right Rhododendron for your climate would be to visit your local nursery or greenhouse. This entry was posted in Botanical Gardens, Landscaping, Photography, Plants, Public Gardens, Uncategorized and tagged beautiful flowers, color, horticulture, photography, rhododendrons on May 28, 2014 by uribg.